"Wherever, forever." From the time we were engaged and all throughout our marriage, we spoke these words to one another as both a promise and a statement brimming with expectancy. That "wherever" turned out to be Greece. We both grew up outside of Reading, Pennsylvania, and we met as kids when our families started attending Glad Tidings Assembly of God in Reading, PA. We grew up as friends and both felt a call to ministry at a young age (Courtney at 8 and Peter at 16). Both of us received our ministry degrees from the University of Valley Forge. In 2009, after three years of dating, we were married. Courtney served as a pastor on staff at Glad Tidings from 2005 to 2014 in various roles (student ministry, missions and outreach, and assimilation). Peter was self-employed in construction and landscape before following the call to ministry, but was highly involved at Glad Tidings and interned in the areas of worship, media, student ministry, and stage design. Peter became the director of the young adult ministry in 2011, and in late 2012, he led a team of college students on a service trip to Greece, where we felt the prompting of the Holy Spirit to move to Greece to build the local church. In 2015, we followed God's call on our lives and moved to Thessaloniki, Greece. Since arriving here, we've had two babies, our daughter, Maevin, and our son, Britton. Read below to learn more about why Greece and what our ministry here looks like. 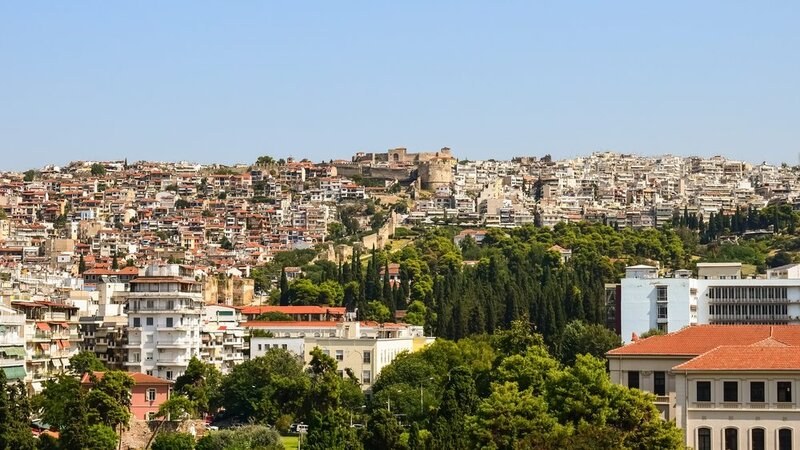 Our dream, prayer, and fervent belief is that we will be a part of a church planting movement that is not limited to the city of Thessaloniki, but that one day, we will have a role in seeing churches planted throughout Greece. We are driven by our passion to see lives transformed by relationship with Jesus and cities transformed by thriving churches. In 2017, we became the pastors of Zoe Thessaloniki, a small church that was launched a few years earlier. Gatherings are held in both Greek and English. Zoe exists to provide opportunities for people to have a life-changing encounter with Jesus, to grow in their faith, to learn to lead in their spheres of influence, and to work together to show compassion to a hurting world. Two of the main universities in Thessaloniki, located next door to one another in the city center, have over 100,000 students in attendance. University students are in a season of their lives where they are the most receptive to the gospel. Because the economic crisis is forcing Greek young people to leave the country in unprecedented numbers looking for jobs, they welcome opportunities to be around native English speakers. These factors have presented unique opportunities for us to connect with Greek students. Each week, Zoe Youth (ages 18-30) meets in local coffee houses for faith based discussion. Many of the students, after building relationships at Zoe Youth, have taken another step to come to Zoe Church. Our desire is to help young people experience life transformation through Jesus, find hope in bleak and uncertain circumstances, and discover their God-given purpose. Because of its strategic location, its difficulty protecting its borders, and its role in the EU, Greece is a one of the primary gateways for victims of human trafficking to enter Europe. We have the opportunity to partner with an organization here that is leading the way in the fight against human trafficking. Our primary role has been in educating the public through creative awareness campaigns and events and working with vulnerable people groups (particularly those living in refugee camps). We are also passionate about helping those in our church catch the heart of God for the marginalized and mobilizing them to serve, whether that is raising awareness about human trafficking, providing blankets and supplies for the homeless, or caring for refugees. Coming Soon! Demolition and renovations are set to begin February 1. We have secured a two-story storefront on the perimeter of the main square in the city center of Thessloniki! Our vision is for this space to be more than a home for our weekly church services and events. We want it to be a space that will connect our church to the community in a meaningful, life-giving, God-glorifying way and is a beacon of hope and light in our city. We plan to use the community center as a study space for university students, a work space for professionals, a place where we can offer creative workshops, business seminars, and English exchange opportunities, a spot for open mic nights, book clubs, discussion groups, photography cohorts, and mom groups, a headquarters for homeless outreach and A-Team meetings (we are launching this local volunteer group dedicated to fighting human trafficking at the grassroots level in our city)... The possibilities are endless and exhilarating. We are looking for churches and individuals who are interested in sponsoring a part of this project whether by sponsoring the purchase of a single chair or covering the renovation costs of an entire floor, or anything in between. Contact us if you're interested in being a part of this project! Some quick stats about the country of our calling. Greece has a population of only 0.4% evangelical Christians. In a country of nearly 11 million people, the Assemblies of God has only 16 churches, compared to hundreds, and even thousands, in other European countries. However, while the population of Evangelical believers may be small, God is at work among them and we are believing with them for a revival. Greece has the highest unemployment rate among all the EU states at over 20% and a youth unemployment rate around 40%. Since 2008, approximately half a million Greeks have left the country in pursuit of work, with educated professionals making up the highest percentage of those exiting. The biblical city of Thessaloniki is now home to over 1 million people. Over 10% of the population are university students. Aristotle University, the largest university in Greece with over 85.000 students on campus, is located in downtown Thessaloniki. Over half the population of the country of Greece is divided between its two main cities, Athens and Thessaloniki. Urban ministry has the opportunity for high impact here. We are seeking individuals, families, and churches who share our heart to reach the world and would like to partner with us through either monthly support or a one-time gift. It's the faithfulness and generosity of our support team that allows us to reach people in Greece. If you'd like to give, click the link below. Feel free to contact us if you have any questions or need any more information. We are booking services in the states for our upcoming itineration, and we would love to share with your church! We have availability in August through October. Send us a message if you're interested! We take a limited number of short-term young adult teams each year. There is also the opportunity for individual young adults to serve with us longer term, for 6 weeks to 3 months. Teams and individuals typically focus on university outreach, with opportunities to visit biblical sites, tour our red light district and volunteer with a human trafficking awareness event. Most of our updates are posted in our private facebook group, so send us a message if you'd like us to add you! We also send out quarterly email newsletters. Subscribe using the link below! Sign up below to receive quarterly email updates and occasional prayer requests.